Often cited but rarely defined, the law of unintended consequences suggests that actions of people—and especially of government—always have unanticipated or unintended effects. There has been a lot of discussion in the farm press this week regarding the impacts of recently enacted steel and aluminum tariffs and the pending NAFTA negotiations on future agricultural exports. The general characterization of the situation was negative, citing expressions of fear and worry on the part of U.S. farmers. 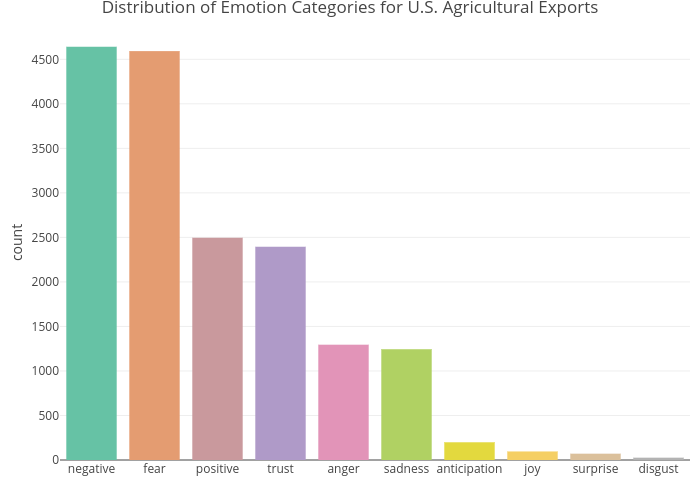 I have been examining the potential of twitter analytics for evaluating current events in U.S. farming and tracking how the consensus mood changes over time. The heightened commentary and awareness of agricultural trade concerns seemed like a perfect opportunity to see what social media opinion has to offer. Twitter is an online social networking service on which users worldwide publish their opinions on a variety of topics, discuss current issues, complain, and express many kinds of emotions. I pulled 2,400 tweets from the past 10 days (March 10-20) from all over the U.S. containing the keywords: agriculture exports, NAFTA, tariffs, trade, ethanol, soybean exports. Words contained in the tweets were evaluated using NRC emotion lexicon which holds 14,182 different words with their emotion and sentiment classes. Most of the tweets had a well defined emotional content. Negative emotions outnumbered positive by nearly 2-to-1. Emotion words referring to fear were over-represented and accounted for nearly half of all emotion words in the sampled tweets. Anger, however, did not seem to be as strong as what might have been depicted in many of the media outlets. Trust was the dominant positive emotion, although I am not sure how to interpret its meaning in this context. Sentiment analysis revealed some interesting results. In particular, the extreme negative rating for one day (March 16th) in comparison with the earlier and later parts of the 10-day period. The R Syuzhet package. comes with four alternative sentiment dictionaries and provides a convenient method for accessing the robust, but computationally expensive, sentiment extraction tool developed in the NLP group at Stanford University. Since these alternative measures are scaled differently, I transformed all of the outcomes to the 0-1 range for comparison purposes. Negative sentiment would be towards zero, while values approaching 1 would be positive. During March 10-14 the sentiment values were running slightly negative prior to reaching extreme negativity for 3 days and returning to near neutral (0.50) on March 18. This suggests that aside from some of the known concerns about twitter analysis, the large drop-off could have been media driven or reflect media twitter activity. Just how important are agricultural exports to farm income? To answer this question, you have to look at calendar year export amounts in relation to gross farm earnings. Since 2008, agricultural exports have accounted for more than 30 percent of gross cash income and averaged just over 32 percent. The largest increase in the importance of exports in the last 20 years occurred between 2005 and 2008 when the percentage share climbed from 22.6 percent to 32.8 percent. That event and subsequent high levels of exports relative to income are in large part attributable to a dramatic reduction in the value of the U.S. dollar against currencies of key trading partners and competing countries . The dollar exchange rate compares its value to the currencies of other countries. When the dollar strengthens, it makes American-made goods more expensive and less competitive compared to foreign-produced goods. The Economic Research Service provide a specific dollar index for agricultural trade, Real Annual Commodity Trade Weighted Exchange Rates. Exchange rates are one of the many factors that determine trade patterns and U.S. exports of agricultural products, but their influence has been powerful in the last decade. Their impact will be tested in the current environment as the Federal Reserve accelerates the path for US rate rises and continues to scale back its balance sheet. Surprisingly, there has not been a lot of annual volatility in the importance of exports to farm income since 2008. This suggests that despite lower dollar valuations, other factors were countervailing. Changes in economic growth rates and incomes of importing countries can impact trade. Witness, the 2014 Ukraine Crisis and the debt crisis in Greece that has been ongoing since 2010. Changes in trade policies (often related to health or environmental concerns) can cause unexpected disruptions to trade patterns. For example, hog exports in 2013 were constrained by the PED virus and in 2015 they were limited due to concerns by China about feed ingredients. In 2017, the Chinese market to U.S. beef was reopened for the first time in nearly 14 years. Finally, U.S. and competing producers are subject to the whims of mother nature that influence world commodity supplies. U.S. farmers and ranchers produce some of the most competitive, high-quality farm products in the world. They also consistently produce more product than can be consumed domestically. As a result, agricultural exports are important to both farmers and the U.S. economy. Concentration of trading partners. The top destinations for U.S. agricultural exports have been limited to a few key countries. China, Canada, Mexico, and Japan represented more than half of FY2016 exports. Strengthening of the U.S. Dollar. Any unanticipated moves by the Federal Reserve to further tighten monetary policy could result in a stronger U.S. dollar. For example, if the Fed decides to remove excess reserves by shrinking the balance sheet through asset sales rather than gradually reducing the balance sheet by ceasing to roll over securities as they mature, which began in September 2017. Increasing competition across key commodities. The U.S. is the world’s top exporter of agricultural products, but Americas global export share has been steadily declining. Rival countries have adopted more modern farming and agricultural practices and improved their transportation infrastructure in recent years. Changing consumer tastes and preferences. Food safety has emerged as an important global issue with international trade and public health implications that will continue to cause disruptions in trade. The consumer movement to reject modern agricultural technology, such as genetic modification, synthetic fertilizers, and irradiation has not faded. Growing uncertainty surrounding trade agreements. Renegotiations have started on the North American Free Trade Agreement, a 23-year-old agreement that removed tariffs and significantly increased commerce between Mexico, the United States and Canada. The outcome of this trade deal will have far reaching implications. 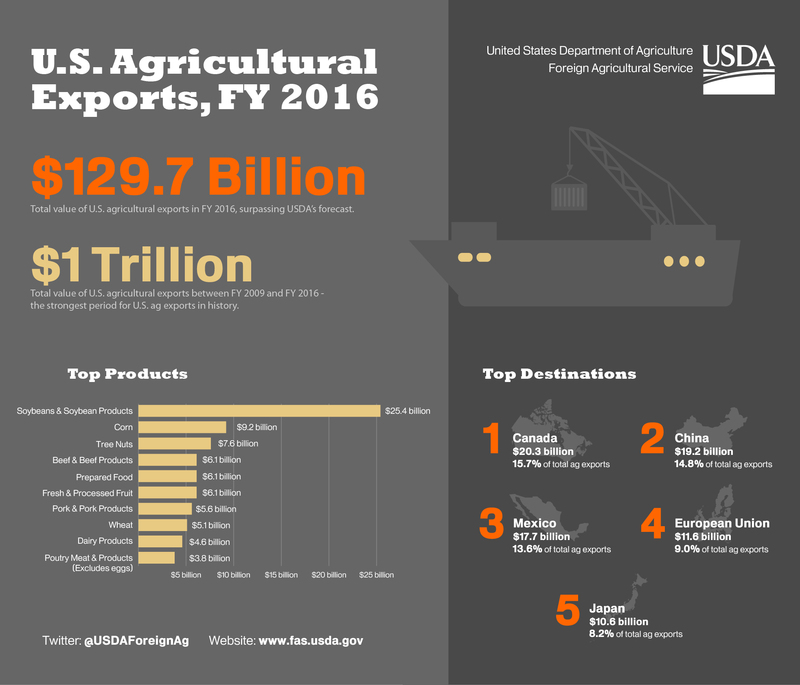 Infographic highlighting the total exports, top destinations and top commodities for U.S. agricultural exports in 2016. All data comes from the USDA-FAS GATS system. Domestic and world economic growth. Steady global economic growth supports world food demand, global agricultural trade, and U.S. agricultural exports. Strong growth in developing countries is especially important because feed use and food consumption tend to be very responsive to income growth in those countries. Greater access to new and existing international markets. USDA and other government agencies have, for many years, invested in a variety of trade promotion programs that have been successful at opening new markets and reducing trade barriers. Continued weak U.S. dollar. Improved per capita income growth in the Eurozone coupled with a more restrictive European Central Bank Policy, and similar improvements in the economic outlook of other key U.S. trading partners in Asia should help dampen the agricultural export-weighted value of the U.S. dollar. Despite the legitimate concerns about U.S. agricultural export prospects in 2018 and beyond, the most recent Outlook for U.S. Agricultural Trade from USDA remains generally positive. Exports in FY2018 are projected to fall slightly below FY2017 levels and come in about $13 billion below the recent high established in FY2014. They regard robust per capita world GDP growth and continued weakening of the U.S. dollar against the currencies of many key trading partners as the two most important factors affecting U.S. agricultural exports. Growth in foreign incomes impact is mostly centered on developing countries since they have a much higher income elasticity for agricultural imports than developed countries. The export situation for U.S. agriculture remains volatile, with the renegotiation of the North American Free Trade Agreement (NAFTA) and potential tariff wars creating the most uncertainty. This is in stark contrast to recent years where export unsureness was more depend on world growing conditions (weather) and U.S. and trading partner monetary policy changes. A complicated formulation just got more complicated. 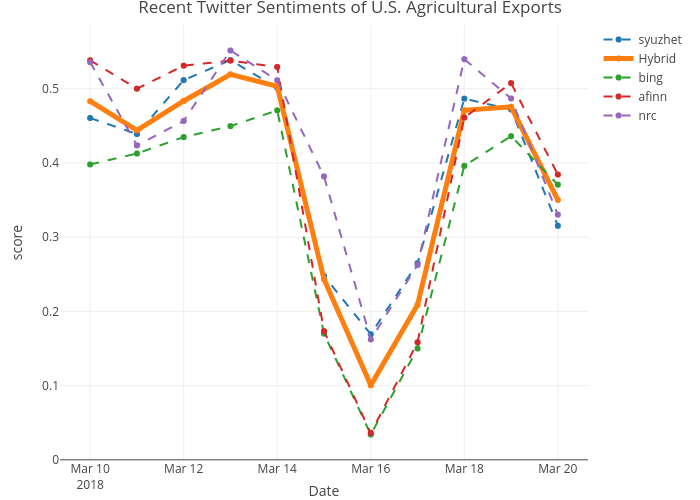 The return of Twitter sentiment to neutral territory suggests a wait and see attitude on agriculture export prospects. Stay tuned. 😀 Thanks to Mathew Shane for his constructive comments and suggestions.